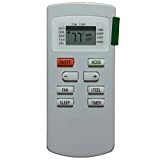 This remote ONLY replaces remote control model: Y512F2 Y512F Y512FA.This is NOT an universal remote control!!! Although many brands are listed, it DOES NOT mean it is a universal for those brands!Please verify that this is the correct model for your unit prior to ordering.Please DO NOT order this remote just because "My AC brand is listed" or "It looks like my old remote". Pleaes check your old remote model, is your old remote model one of these: Y512F2 Y512F or Y512FA???? Please NOTE!!! 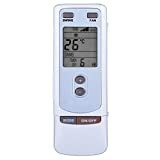 This remote CAN NOT be used to GE window air conditioners which has a similar remote without display!!! They are totally different remotes!! Please DO NOT place a wrong order which may waste your time. Please send us message if you have doubts before ordering. Thanks! This is NOT an universal remote control!!! Although many brands are listed, it DOES NOT mean it is a universal for those brands! Please DO NOT order this remote just because "My AC brand is listed" or "It looks like my old remote". 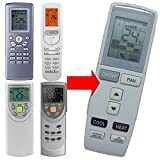 Check your old remote model, is your old remote model one of these: Y512F2 Y512F Y512FA???? Please NOTE!!! This remote CAN NOT be used to GE window air conditioners which has a similar remote without display!!! Replacement for your old remote control model number Y512 , no matter what brand your air conditioner is. Replacement for remote control model number Y512 , as long as your old remote control model is Y512Please confirm your old remote control model is Y512 (the same with picture) before placing order.If your old remote control model number is not Y512, although your AC brand is in the listing, please DO NOT place order. Note: This is not an universal remote control. It only replaces remote control model Y512 of many different brands. Please confirm your old remote control model is Y512 (the same with picture) before placing order. This is not an universal remote control. It doesn't need any instruction. 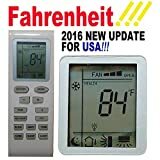 Check your old remote model is Y512 prior to ordering!! 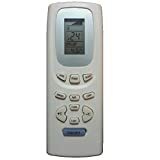 This remote controller is a replacement and Compatible for: GREE / GE / TRANE / Electrolux / YORK / LENNOX / BLUE / STAR VIVAX / TOSOT / GE / Carrier / Inventor / Condor / ATC / ANWO Comfortstar / ClimaMania / AERMEC / Aeronik / ASAMI climamania / climoo / digi / DIGITAL / ecoaire / ducasa / EWT EWT / CLIMA / Fisher / fujitherma / Goodweather / Kenso MILLER / MUNDCLIMA / NCP / nord / pac / pensonic / RENOVA SIGMA / sinclair / roca / york / Tango / Tasaki / tempblue trendair / unicalair / vertex / vertex / vesser / vivax ....and other brands Remote control model： Yx1f5f Yx1f Yx1f2 Yx1f3 Yx1f4 Yx1f5 Yx1f1f Yx1f4f Yx1f2f Yx1ff If you have any questions or find other remote control model, please feel free to contact us,or leave us a message. We are professional in remote control for ACTVDVDprojector and so on.